The Stand in the Schoolhouse Door took place at Foster Auditorium at the University of Alabama on June 11, 1963. George Wallace, the Democratic Governor of Alabama, in a symbolic attempt to keep his inaugural promise of "segregation now, segregation tomorrow, segregation forever" and stop the desegregation of schools, stood at the door of the auditorium to try to block the entry of two African American students, Vivian Malone and James Hood. Attempting to block integration at the University of Alabama, Governor of Alabama George Wallace stands at the door of Foster Auditorium while being confronted by US Deputy Attorney General Nicholas Katzenbach. In response, President John F. Kennedy issued Executive Order 11111, which federalized the Alabama National Guard, and Guard General Henry Graham then commanded Wallace to step aside, saying, "Sir, it is my sad duty to ask you to step aside under the orders of the President of the United States." Wallace then spoke further, but eventually moved, and Malone and Hood completed their registration. The incident brought Wallace into the national spotlight. On May 17, 1954, the Supreme Court of the United States handed down its decision regarding the case called Brown v. Board of Education of Topeka, Kansas, in which the plaintiffs charged that the education of black children in separate public schools from their white counterparts was unconstitutional. Brown v. Board of Education meant that the University of Alabama had to be desegregated. In the years following, hundreds of African-Americans applied for admission, but with one brief exception,[Note 1] all were denied. The University worked with police to find any disqualifying qualities, or when this failed, intimidated the applicants. But in 1963, three African-Americans —Vivian Malone Jones, Dave McGlathery and James Hood—applied. In early June a federal district judge ordered that they be admitted, and forbade Governor Wallace from interfering. General Henry Graham salutes and then confronts George Wallace. 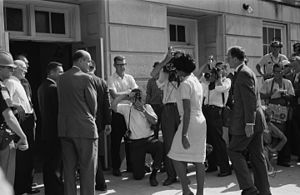 Vivian Malone Jones arrives to register for classes at the University of Alabama's Foster Auditorium. On June 11, Malone and Hood pre-registered in the morning at the Birmingham courthouse. They selected their courses and filled out all their forms there. They arrived at Foster Auditorium to have their course loads reviewed by advisors and pay their fees. They remained in their vehicle as Wallace, attempting to uphold his promise as well as for political show, blocked the entrance to Foster Auditorium with the media watching. Then, flanked by federal marshals, Deputy Attorney General Nicholas Katzenbach told Wallace to step aside. However, Wallace interrupted Katzenbach and gave a speech on states' rights. Katzenbach called President John F. Kennedy, who had previously issued a presidential proclamation demanding that Wallace step aside, and told him of Wallace's actions in ignoring the proclamation as it had no legal force. In response, Kennedy issued Executive Order 11111, which had already been prepared, authorizing the federalization of the Alabama National Guard. Four hours later, Guard General Henry Graham commanded Wallace to step aside, saying, "Sir, it is my sad duty to ask you to step aside under the orders of the President of the United States." Wallace then spoke further, but eventually moved, and Malone and Hood completed their registration. In the days following the enactment, the National Guard were ordered to remain on the campus owing to a large Ku Klux Klan contingent in the surrounding area. Wallace and Kennedy exchanged volatile telegrams over it. Wallace objected to Kennedy ordering the Guard to remain on the campus and said that Kennedy bore responsibility if something happened. Kennedy responded stating that Executive Order 11111 made it clear that responsibility for keeping the peace remained with the State Troopers under Wallace's control and said he would revoke the order if assurances were made. Wallace refused stating he would not be intimidated and cited that Executive Order 11111 was passed without his knowledge. Executive Order 11111 was also used to ensure that the Alabama National Guard made sure that black students across the state were able to enroll at previously all-white schools. It was complemented by Executive Order 11118, which provided "assistance for removal of unlawful obstructions of justice in the State of Alabama." The incident was detailed in Robert Drew's 1963 documentary film Crisis: Behind a Presidential Commitment. The event was depicted in the 1994 film Forrest Gump, in which the title character appeared at the event, and in the 1997 television movie George Wallace. In June 2012, George Wallace, Jr. commented on his father's legacy, and mentioned the reference to the event in Bob Dylan's 1964 song "The Times They Are a-Changin'": "Come Senators, Congressmen, please heed the call. Don't stand in the doorway, don't block up the hall." Wallace, Jr. said, when he was 14, he sang the song for his father and thought he saw the look of regret in his father's eyes. ^ In February of 1956, Autherine Lucy started classes under guard at UA as a graduate student after having been admitted three years earlier. Her presence was met with riots, and the administration found excuses first to suspend, and then expel her shortly after she enrolled. ^ a b Elliot, Debbie. Wallace in the Schoolhouse Door. NPR. June 11, 2003. Accessed February 19, 2009. ^ a b Lesher, Stephan (1995). George Wallace: American Populist. Da Capo Press. p. 233. ISBN 9780201407983. ^ Democratic Governor George C. Wallace's School House Door Speech. Accessed February 19, 2009. ^ "Address on Civil Rights". Miller Center of Public Affairs. June 11, 1963. Archived from the original on January 17, 2013. Retrieved February 7, 2013. This afternoon, following a series of threats and defiant statements, the presence of Alabama National Guardsmen was required on the University of Alabama to carry out the final and unequivocal order of the United States District Court of the Northern District of Alabama. ^ Andrew Cohen (May 9, 2012). "Nicholas Katzenbach, Unsung Hero of America's Desegregation". Theatlantic.com. ^ Wallace, George C. (December 12, 2012). "Governor George C. Wallace's School House Door Speech". Alabama Department of Archives and History. Montgomery, Alabama. Archived from the original on August 6, 2002. Retrieved April 14, 2016. ^ "Executive Order 10730: Little Rock Nine: Integration of the University of Alabama". Shmoop. Retrieved May 11, 2017. ^ a b Willis, Jim (2015). 1960s Counterculture: Documents Decoded: Documents Decoded. ABC-CLIO. p. 82. ISBN 1610695232. ^ a b c d "Dueling Telegrams: 1963 verbal power play between Wallace and JFK" (PDF). Alabama State Archives. Retrieved May 11, 2017. ^ "Kennedy federalized National Guard to integrate Alabama public schools (Sept. 10, 1963)". AL.com. Retrieved May 11, 2017. ^ "Executive Orders Disposition Tables". National Archives. Retrieved May 11, 2017. ^ United States General Accounting Office (1965). Decisions of the Comptroller General of the United States. 43. U.S. Government Printing Office. p. 296. ^ Byers, Thomas (1996). "History Re-Membered: Forrest Gump, Postfeminist Masculinity, and the Burial of the Counterculture". Modern Fiction Studies. 42 (2): 419–44. doi:10.1353/mfs.1995.0102. Retrieved February 28, 2009. ^ Paul Grainge (2003). Memory and Popular Film. Manchester University Press. p. 229. ISBN 978-0-7190-6375-6. Retrieved February 28, 2009. ^ Behind the Magic of Forrest Gump: "George Wallace." in Forrest Gump special collector's edition (DVD). 2001. ^ Grayson, Wayne (June 8, 2012). "Son says former Gov. George Wallace repented for past". The Tuscaloosa News. Retrieved January 15, 2016. Sarah Melton, "A Sleight of History: University of Alabama's Foster Auditorium", Southern Spaces, October 15, 2009. The Crimson-white (University of Alabama student newspaper), June 9, 1963 and June 13, 1963, W. S. Hoole Special Collections Library.